on Sunday, December 2nd from 11:00 am until 2:00 p.m.
We will raffle an amazing $15,000 in prizes, for a $50 donation for the raffle ticket. 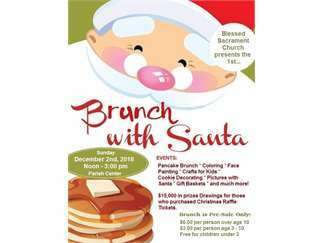 The brunch is $6.00 per person over age 10, age 3 – 10 is $3.00 and children under 3 are free. (Pre-sale ONLY) The brunch will include 3 sausage links, fruit, orange juice, milk, coffee, water and all you can eat pancakes. We will have much to do for the children along with pictures with Santa. (Please note that we will NOT be asking for prize basket donations.) Don’t miss it!